For Julian Rodriguez, it’s easy to say what makes him the proudest about his family’s tortilleria. “The community we serve, the neighborhood we support, that’s what gives us the most pride,” he said. The tortilla company El Popo has two locations. At their facility in Archer Heights, two million of the familiar flat round wraps come off the lines every day in two varieties: corn and flour. After the overnight cook, the corn is ground into masa using custom-made grinding discs made of volcanic rock. From there it’s pressed into a sheet, cut out with molds, and zipped through a blazing hot oven for less than half a minute. 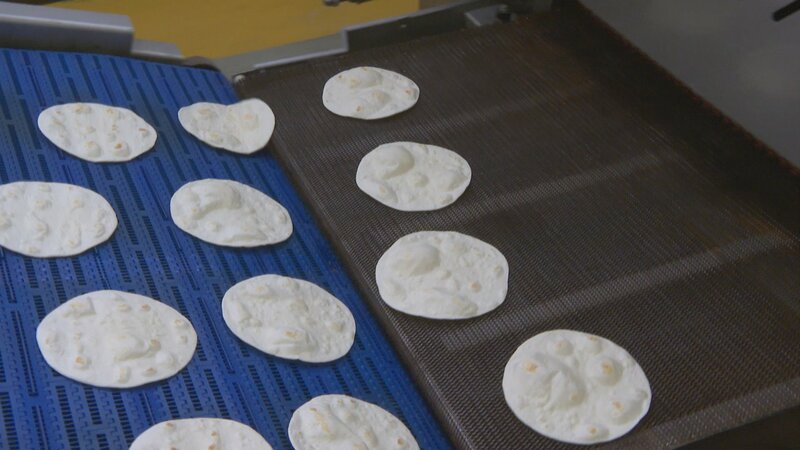 The tortillas are stacked by machine, then packaged by hand, and they don’t stick around the warehouse for very long. “We rarely hold onto product longer than two days,” said Rodriguez. Mexican immigrants who came to Chicago for factory work created the demand for products like El Popo’s. Like all immigrants to America, their appetites for the foods of their home country meant opportunity for ethnic food manufacturers. El Popo was instrumental in the existence of at least one Chicago restaurant. Juan Lazo, himself a Cuban immigrant, says the countless tacos and burritos coming from his restaurant Lazo’s Tacos have been made using El Popo’s product from the day it opened 30 years ago. “I knew the [Ernesto] the owner of El Popo, they told me to open a Mexican restaurant, he said it was a good business. I took his advice, and it’s been going well ever since,” Lazo said. On the other side of the Archer Heights factory, Rodriguez points to one ingredient he says is the key to the perfect flour tortilla: lard, and lots of it. At the moment, two sizes of flour tortillas are running, and though they have the same ingredients, the recipes differ depending on their use. Taco sizes are made to be soft and fluffy, where burrito sizes are made to be strong enough to hold the hefty burrito fillings inside. “They’re holding higher contents, some [burritos] can be up to a pound, pound and half, and they take more handling, so we can’t have them break,” said Rodriguez. Minus the lard, the process of making a flour tortilla isn’t far off from another fluffy, floury flatbread Chicagoans know and love: the pita. At Grecian Delight in Elk Grove Village, 7-inch pita breads spin off a gleaming modern line, destined for restaurants and grocery stores across the country. The springy pita dough is mixed and extruded into a sheet, then run through rollers to get it to the right thickness. Then the dough is cut, proofed and swiftly baked in a 900-degree oven for a minute and a half. After a trip through a spiral cooling tower, it’s frozen to ensure a longer shelf life. Then the pitas are stacked and packed, destined for restaurants and grocery stores across the country. Grecian Delight also has an immigrant origin, says president and CEO Peter Parthenis, whose father Peter Senior came to Chicago from Greece as a teenager, and worked his way through college waiting tables. “When he started the company he was really a true pioneer by really being the first in the U.S. to manufacture and sell traditional Greek street food, which is called the gyro. So you got the pita, the gyro and the tzatziki, which is the king of street food in Greece,” he said. Parthenis says his father saw a place for gyros in the restaurants his fellow Greek immigrants owned. He convinced them that the Greek sandwich would succeed in America, too. “I remember him telling me, I would watch the consumers eat the product and he would see the expressions on the customers faces, saying wow, you know, they enjoyed it. So then he just started going restaurant to restaurant and asking customers to see if he could make the product for them,” Parthenis said. One of those tzatziki-slinging customers is in the heart of Greektown, where an established Greek community moved in the 1960s from a few blocks south. At Mr. Greek, the Vitogiannis brothers sell 200 to 300 of the Grecian treats a day at the restaurant their father opened in 1997 next door to his butcher shop. Peter Vitogiannis says he and his brother have been working in Greektown “since we were little boys, since we were kids.” They say that having a local source for the pita bread that is the stage for their star sandwich has helped their business grow. And now, decades after immigrants brought their food traditions to Chicago, those traditions have become part of Chicago’s tradition – two more of the breads baked here that round out our beloved food culture.